Explore MoreVIDEO: Myth or reality? Get a closer look at the Death Crawler. , ON TV: Check the Lost Tapes Episode Guide for air dates. A GIANT CENTIPEDE? Are there giant, killer centipedes lurking in the rain forests of South America? As a matter of fact, yes, there are. Scolopendra gigantea, also known as the Amazonian giant centipede or Peruvian giant yellow-leg centipede, is the world's largest living centipede, regularly reaching lengths of 10 to 12 inches, with one reported specimen in Venezuela measuring 18 inches in length. This 46-legged monster feeds on frogs, tarantulas, birds, lizards, rodents and even bats, catching them mid-flight as the centipede hangs from a cave ceiling. Scolopendra gigantea is a very swift runner and highly adept climber. Like all centipedes, it has modified claws that curve around its head and deliver venom to its prey. EVEN BIGGER CENTIPEDES? Some claim that a centipede several times the length of Scolopendra gigantea lurks in the unexplored regions of the Amazon, perhaps a living fossil from an era when giant insects were common. 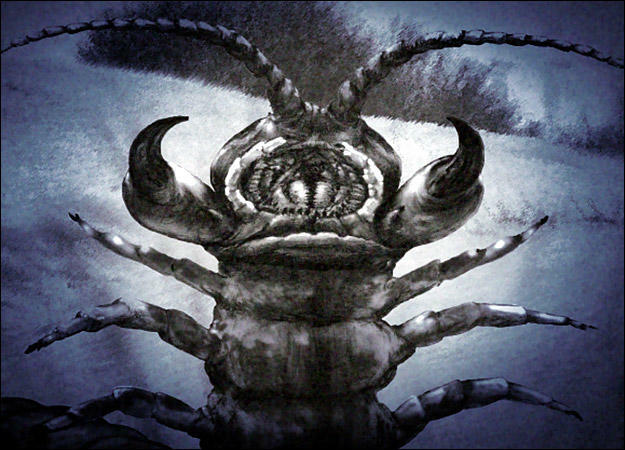 Euphoberia, which lived 300 million years ago, is the largest centipede at record, growing up to 39 inches in length. It lived alongside the largest land invertebrate ever: Arthropleura, a close relative of the centipede. Arthropleura reached 8- 1/2 feet in length. These incredible insects vanished from the fossil record at the end of the Permian period when oxygen levels declined sharply and large vertebrate predators appeared on land. A MAN-KILLER? The largest living centipede, Scolopendra gigantea, has a toxic, extremely intense bite that's been likened to a gunshot wound or broken bone. It can induce anaphylactic shock in those allergic to bee stings and has been known to kill small children on very rare occasions. If a much larger centipede, like Euphoberia, were to have survived from prehistory, its venom might have the potential to kill a full-grown man.